Medical, Legal, 16 Foreign Languages Spell Checking. Instantly works with all Windows programs. 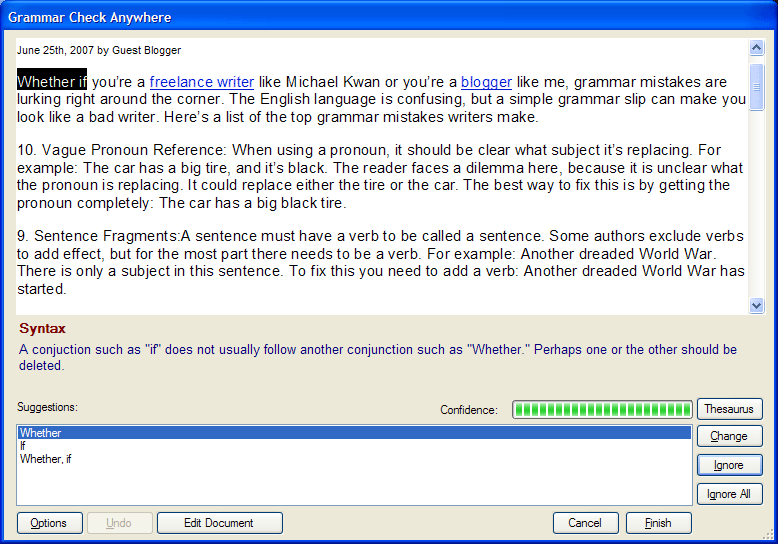 Grammar Check Anywhere is a professional contextual grammar check and spell check software that works with all Windows programs, including custom programs. When a grammar mistake is found, Grammar Check Anywhere gives an explanation of the grammar rule that has been broken with instructions how to correct the grammar mistake. It also provides specific rewriting suggestions for correcting each grammar mistake. See below, there are examples of this in action. Once Grammar Check Anywhere is installed, when the text you want to check is in focus, in any program, press the F7 key on your keyboard to grammar and spell check. You can change the F7 key to any key you desire. 0 Response to "Grammar Check Anywhere 2011"